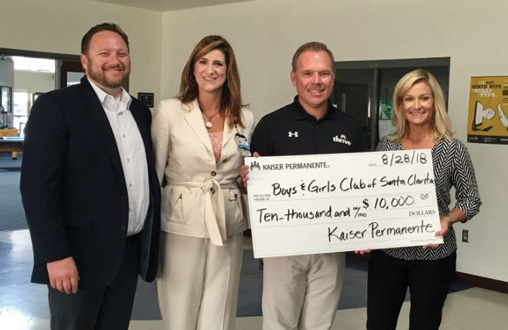 Kaiser Permanente is proud to announce eight Santa Clarita Valley nonprofit organizations have been awarded more than $62,000 in community benefit funding due to their dedication to improving health and wellness locally. For more than half a century, Kaiser Permanente has demonstrated a commitment to enhancing the health of local communities. One of the ways Kaiser Permanente fulfills this social mission is by providing financial support for local nonprofit health and human service organizations, with an emphasis on under-served populations. • Boys & Girls Club of Santa Clarita Valley encourages low income youth in the Santa Clarita Valley to adopt healthy lifestyles through their half hour hustle after school program, provision of healthy snacks, cooking classes, and team and recreational sports. • Bridge to Home expands its Healthy Lives Medical and Dental programs with a Health Navigator providing on site coordination and case management for homeless individuals in the Santa Clarita Valley connecting them to clinical care and helping clients establish medical homes. • Carousel Ranch provides equestrian therapy and physical exercise for children with special needs who are at risk of obesity resulting from a sedentary lifestyle. • Child & Family Center provides school-based mental health support and counseling for children showing early signs of behavioral health problems in elementary school. • Samuel Dixon Family Health Center provides much needed retinal screenings for low income uninsured diabetic patients in the Santa Clarita Valley. • Santa Clarita Valley Senior Center provides case management, health & wellness programming, and screenings to low income seniors in the Santa Clarita Valley. • Santa Clarita Valley Youth Project provides access to campus-based mental health services such as support groups and peer counselling for at-risk junior and high school students in the Santa Clarita Valley. • Single Mothers Outreach provides family case management and coordination of social and mental health services for low income single parents and children in the Santa Clarita Valley. For more Kaiser Permanente Community Benefit programs, visit community.kp.org.